An array of architectural models from the Spring 2016 Design IV studio, led by Professor Diane Lewis, Professor Peter Schubert, Instructor Daniel Meridor, Visiting Assistant Professor Daniel Sherer and Visiting Lecturer Francois de Menil is now on display in an unlikely venue. 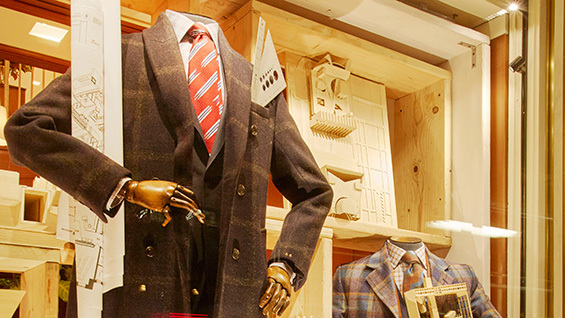 The East 57th Street windows of upscale men’s clothing retailer, Turnbull & Asser, feature models by Aimilios Davantlis Lo, Jorge Flores, Sam Koopman, Kelsey Lee, Piao Liu, Hui Rong Liu, Hugh Scott Moncrieff, Stephanie Restrepo and Kyle Schroeder, channeling the lifestyle of the urban architect. Inspired by the display of fourth year design studio work in the ground floor windows of Cooper Union’s Foundation Building as part of the 2016 End of Year Show, Zander Scheider, Turnbull & Asser’s director of design, called on the talents of Cooper’s architecture students to enhance the architect-themed display. The installation will be on view until November 11th at 50 East 57th Street. Read More on Cooper Union’s website.